NOW COMES WITH PRESSURE REGULATOR FITTED AS STANDARD ! 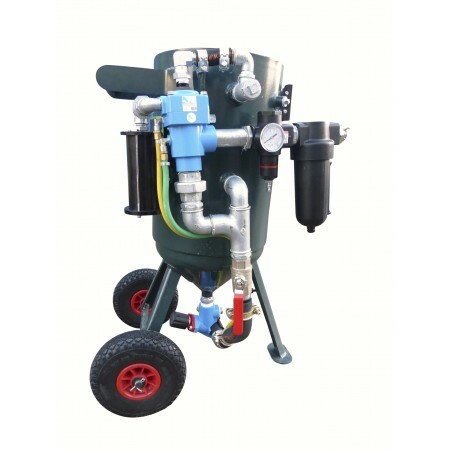 THE 50 LITRE BLAST POT IS THE MOST POPULAR SIZE POT, ONE OF THE BEST SANDBLASTERS AVAILABLE, AND BEST SIZE POT FOR THE 'ONE MAN BAND' BUSINESS COS' YOU CAN GET IT IN AND OUT OF YOUR VAN EASILY ON YOUR OWN.... THIS POT HAS 'PRAM' TYPE HANDLE WHICH MAKES THE TASK INFINITELY EASIER THAN THE LARGE LOOP ROUND HANDLES OF MANY OTHER BLAST POTS.